1.) Today I could do without: all the unnecessarily humongous trucks in Houston. ** This rant is brought to you by Houstonians. If everything is bigger in Texas, why does it seem like so many men on the road are compensating for something? Oooooh, yes! I went there. Houston is the third largest city in the country. It's metropolitan. There are more corporate businesses than farms. So why the gigantic trucks? Please. Someone enlighten me, because right now, I just think they're trying to... fill a void. 2.) Today I could do without: the entire Kardashian family. ** This rant is brought to you by every headline, radio show, TV program, and magazine that continues to bring up Kim Kardashian filing for divorce after 72 days of marriage -- her second marriage, no less. Who says that the "evil, sinful gays" are going to ruin the institution of marriage? Kim and all the other Hollywood "celebrities" have already done that for us. Furthermore, the Kardashians need to be permanently removed from the E! network, and Ryan Seacrest should be sued. I'm serious. I'm sure he's broken some sort of FCC rule as the executive producer of all Kardashian shows. It's conflict of interest when he has exclusive interviews with his "reality stars" on his radio show. How is he permitted to promote his own product which makes him millions of dollars when another lesser known radio host would be fired for promoting his own garage sale? Talk about a man who knows how to work the system. My former boss at The AjA Project sent me this post. I guess someone agrees with me! 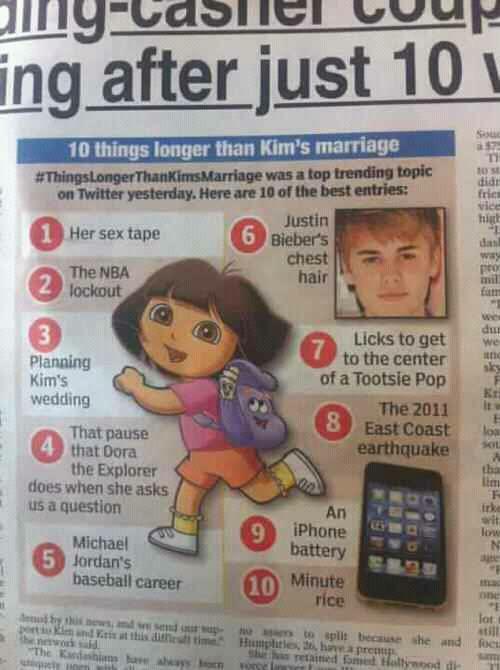 the part with dora is my favorite! I absolutely love the Dora one, too!